Are you your own worst job search enemy? We all know that job search can be tough and there are so many reasons why your search may take longer than you had hoped. The economy, your industry, your experience and competition are just a few of the factors that will impact your ability to land a new job. But what if it's more complicated than that? What if it's the unthinkable – you are the reason you are not getting any job offers? Maybe you've thought about it, but if you haven't, you should. YOU are the single largest factor in getting a new job (or promotion or raise). It's just not enough being the best and the brightest (and it never was). It's about the entire package – how you present yourself, your resume, your cover letter, your network, your interview skills, your experience – and the list goes on. So now that you've given it some thought, what are the reasons you won't get hired? Hiring managers want to know that you can do the job and the only way they will consider interviewing you is if your resume clearly demonstrates that you have what it takes to get the job done. If you're not sure what to include, take a look at some job descriptions for your function (you should be able to find lots if you do a search). Does your resume include enough job specific information to convince a reader that they should hire you (be honest with yourself)? If not, time to make some changes. You may need to have a few versions of your resume depending on the types of jobs / functions that you apply for. 2. You Didn't Bother to Proof Read Your Resume, Cover Letter, etc. My biggest pet peeve when reading a resume or cover letter is errors. All of your job search documents should be error free. Just running a spell check is not enough. You should focus on sentence structure, punctuation, word usage, etc. Once you think that it is perfect, send it to some friends, family and peers in your network to read it as well. You will be surprised to find out how many errors may have slipped by. But wait, you're not done yet. 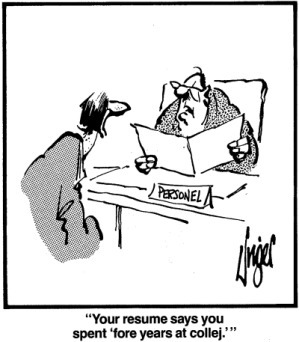 When you forward your resume to a recruiter, they (I would argue) should be reviewing your resume as well and suggesting changes as appropriate. They see more resumes than anyone else and are best placed to help adjust your resume for the best possible error-free profile. It makes absolutely no sense to submit your resume for jobs that are “close” or maybe not even close (for the same reasons as indicated in #1 above). You will be wasting your time, the recruiter's time and the hiring manager's time. Additionally, you will potentially be “burning bridges” which may mean that when you submit for a perfect match, your resume and application may go directly to the trash folder. That being said, consider carefully how/when you want to leverage multiple resumes. Just because you are great at what you do, have the perfect resume and are generally the life of the party, does not mean you are good at interviewing. It's not only about qualifications and being well spoken, it's also about being able to answer those “soft” questions. Every manager has a different interview style. Some prefer to ask technical questions while others prefer to see what “makes you tick” (and some like to do both). Read up on interview questions for your industry and job function. Also take a look at all of those “soft questions” and ensure you know how you would answer them. Don't worry about those “why is a manhole cover round?” questions. You can't possibly know the answer to every one and the general thought these days is that those questions don't add any value. One more important point, make sure you are prepared with the questions you want to ask as well (see below)! If you don't know anything about the company where you are interviewing, then what's the point of going on the interview? For one, you should know if it's a good place to work (more on that in a bit). But more importantly, you should try to learn everything you can about the company. How big are they? Are they profitable? Where are their offices/locations? Do you like the industry? That's just the tip of the iceberg for your research. With the right Internet search, you should be able to uncover lots of information on the company. If they are a privately held company, it may be hard to get much information, which leads us back to “is it a good place to work?”. This is a good example of where LinkedIn can help. Start with your network to see if anyone works at the target company. If not, look to see who has connections with someone at that company. If you are persistent, you will find some contacts that can provide background data. How to dress for an interview can be a tough question. Much depends on your industry, the company and the role you would play. There are some basics that (should) go without saying. No shorts, tee shirts, sneakers, etc. Whether or not “business casual” is okay or formal dress is more appropriate really depends on some of the criteria raised in the first sentence of this paragraph. The good news is that there is plenty of info available on the Internet on this topic. How to dress is also a topic that you can and should bring up with your network. If you are applying for lots of jobs, it can be tedious to write cover letters for each opportunity. This is another perfect example of where cutting corners does not generally work in your favor and where you need to spend the time on personalizing the cover letter to each application. In addition to mentioning the title of the job and briefly indicating why you are the perfect candidate, you should try to add something specific to the interview so that the reader will know that you were listening wrote the thank you note specifically for them (starting off with their name in the salutation is a big help – “dear sir or madam” is not usually the best start). Some will say that thank you letters following an interview are a thing of the past. I disagree. Everything else being equal (between you and another candidate), a properly written thank you note will give you an edge. Again, this should not be a form letter and, to the extent that you've interviewed with two or more individuals in the organization, each thank you letter must be personalized. You should mention specific topics discussed during your interview as well as (most importantly) reminding the hiring manager why you are the best person for the job. “You've spammed recruiters with your resume to the point where they know your name and hit “Delete” as soon as they see it. The recruiting world is surprisingly small (especially if you're specialised), so hitting “Apply” endlessly puts you at real risk of ruining your reputation. Joey Trebif is a senior finance executive from the New York area who has extensive experience in job search and career advice. Joey blogs about career advice, job search advice and job search site reviews at CareerAlley and can be found on Twitter at @CareerAlley and Google+. 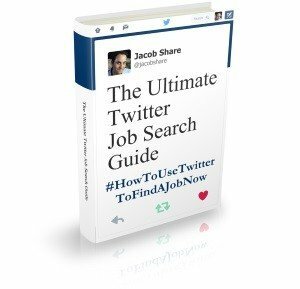 This article was part of the The $10000 7th Annual JobMob Guest Blogging Contest. If you liked this article, you'll also enjoy How To Get Hired As A (fill in here). 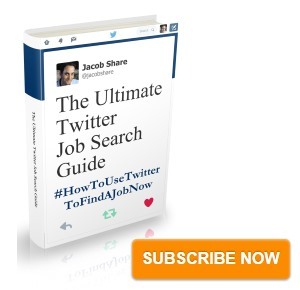 Subscribe to JobMob via RSS or email and follow me on Twitter for more ideas on getting hired faster. Joey, there is so much food for thought here. It really is amazing how the most basic job search elements can be so easily messed up. I just re-read this in preparation for my job interview on Monday! I hope I’ve gotten past all of them. Your score was a perfect 999! May you have all the good luck the number brings. I’d add #9: You’ve spammed recruiters with your resume to the point where they know your name and hit “Delete” as soon as they see it. Recruiting world is surprisingly small (especially if you’re specialised), so hitting “Apply” endlessly puts you at real risk of ruining your reputation. Back off, chill out, rewrite your resume so that it looks different, and be very selective about the applications you submit. Irene- now that’s what I call a blog comment that demands attention. I’ve added your #9 above- thanks!